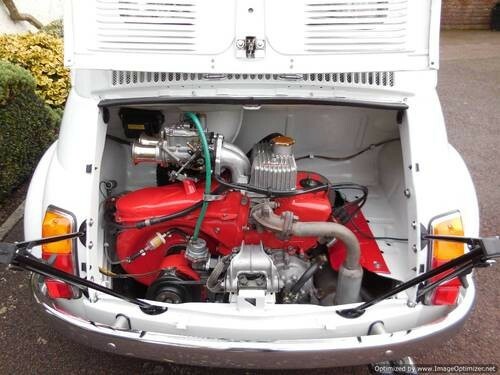 For Sale – Abarth 595 (Genuine) 1967 / Nut & Bolt Restoration – Mint! | Classic Cars HQ. 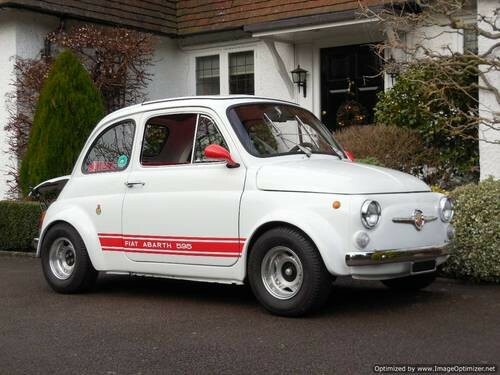 For Sale - Abarth 595 (Genuine) 1967 / Nut & Bolt Restoration - Mint! Abarth 595 (Genuine) Classic / 1967 / LHD – Nut & Bolt Restoration - Exceptional! £29,995 This highly desirable & original Abarth 595 is the genuine article sourced from an Italian collector (Roberto) whom is a marque expert & has resided over this stunning example since 15th May 2007. He over saw the nut & bolt rebuild to concours standard within his tenurship & it has taken us 2 years to prize it out of his hands, but it was well worth the wait as the vehicle is in Mint condition today. This wide body Abarth is based on a Fiat 500F manufactured in 1967 & was dispatched straight to the Abarth factory prior to first Italian registration. Thus the vehicle was first registered in Treviso Northern Italy (Where we also purchased it from) to its first owner Francesco & was registered from new as a Fiat 1105 Abarth 595. In fact the vehicle has retained its original number plates & resided in Treviso most of its life with the brief exception of a period in Roma. It has the Abarth body number stamped into the body as one would expect & the engine has the ABA engine number stamped into the block. The original blue Italian Log book, Carat Did Circulation Per Autovettura fully stamped accompanies the vehicle (Showing it as a Abarth 595 along with the VIN & ABA engine number still matching) along with the current original ACI Automobile Club D’Italia Certificato Di Proprieta which also confirms the vehicle as an Abarth 595. We have also spoken directly to ACI in Italy to confirm matters & with the historic club, along with Fiat UK (For which we have the confirmation certificate confirming the vehicle as an Abarth) in regard of the original Fiat VIN number of which we still have the original VIN plate in the file. This truly exceptional & beautifully restored matching numbers example has only had 5 owners from new, with the last since 15th May 2007. We took copious pictures of the vehicle in Italy at the owner’s home, whilst situated with his other classis Fiat racing cars in his large dry barn. This is the best & most correctly restored Abarth 595 we have ever offered & probably as good as new. I am half hoping that I don’t find a buyer, as now I have driven it several times; I would be more than content to have this example in my own private collection. It is mint & as Roberto was an Abarth enthusiast his knowledge & understanding of the correct parts & original detailing is exceptional. Roberto entrusted this very sound & straight example to his local specialist whom embarked on a full pain staking nut & bolt restoration to concours standard under his watchful eye. Basically every thing has been reconditioned & only replaced with a genuine part if required. So in brief: Complete strip to bare metal shell, the structure & floors were found to be excellent. The car was fully rewired. The engine was stripped, checked & rebuilt only as required with genuine parts to factory Abarth standards & the competition gearbox which is a synchronized unit was rebuilt. The handbrake cable was changed, racing clutch replaced, all pedals refurbished, the petrol tank was fully refurbished and flushed. 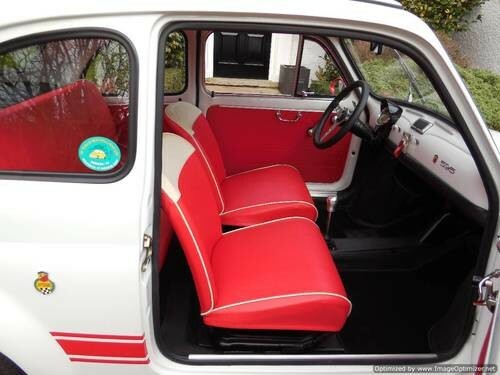 The interior was also fully and expertly retrimmed in red / cream along with the complete door card set, all as it left the factory, including the refurbishment of the fixed head roof panel. All other items of interior trim were refurbished. A new correct full floor mat set was fitted along with again the correct full over mat set. All lights were replaced & the correct surrounds were machine polished, all new rubber items were replaced including the door seals, window & side window seals, new windscreen rear windows fitted, new bushes, new struts, complete brake system overhaul & part replacement only as required, new starter motor, in fact every mechanical item was refurbished as Roberto wanted to keep as much of the car original as possible. The bumpers & brackets were replaced, the wing mirrors professionally refinished, the original racing wheels were fully refurbished along with new matching Yokohoma tyres fitted. The car was fully painted whilst stripped to bare shell (Inside & out) at this time in the original Fiat bianca shade which the car has worn all its life to date, with red Abarth 595 graphics. The underside was sprayed in black stone chip paint to offer protection going forward for the next 47 years. This truly impressive example is just showing 8,296 miles on the 150KM/Hour speedo, but has only done circa 1500 miles since the nut & bolt restoration, most of which were Roberto taking it to classic car shows, of which there is still entrance evidence in the history file. Since being in our possession, we have been meticulous in our further preparation prior to offering this exception example to the market by undertaking the following works: Adjusted the steering geometry, supplied a fresh MOT and conducted a multipoint check, replaced the fuel with £25 of new super unleaded, tuned the carbs, set the timing, adjusted & cleaned the brakes, machine cleaned the rocker cover & replaced the gasket, Fitted new engine rubbers, grommets, seals & trims. Engine heat shield pad & given the cheeky little chap a full service, just to be sure!, Refurbished the period tool kit & fitted an Abarth Key ring. To complete this masterpiece the vehicles paintwork was flatted back before being machine polished to perfection & fully detailed by our resident detailer. The car is on the button & ready to go & show or just enjoy… We will UK register it in the new owners name so they can be the first UK registered keeper or export around the world with the original Italian papers. This beautiful example is eminently usable as it has a fully recommissioned engine, it drives like new & as good as it looks! The vehicle comes with the original blue Italian log book, Original Italian ACI Certificato Di Proprietra, Fiat UK confirmation certificate, Fresh current UK MOT, UK NOVA certificate, Specialist parts invoices from Ricambio International Ltd, Copious photos showing car in Italy along with pictures of our works listed above, Classic car show entrance details, Club details… The car looks factory original & is no doubt better than when it left the factory in 1967. It’s probably one of the best unmolested examples in Europe. It has been sympathetically restored by people who know the marquee, is a collector’s opportunity & a superb investment. Hence this cheeky chappy can now get UK registered, has a fresh MOT & is being offered for sale for the first time on our shores. Fiat Bianco (233) paintwork with a red / cream interior, including matching door cards & nero carpet set, with complementing bianco fixed rood panel. Fresh MOT with NO advisories. Free historic road tax. Keys on Abarth key ring, original tool kit, correct original jack & spare wheel with tyre. Fully refurbished Low racing wheels fitted with as new Yokohama matching tyres. Model History Born in 1908 in Austria, Karl Abarth moved to Italy with his family just after the first World War. He built his first car in 1928 at the age of only twenty. He was also five times European motorcycle champion in the 30s. During this time he also designed his first exhaust system, which was later to become one of the specialities of the company that he founded in Italy in 1949. Although also linked to other manufacturers such as Porsche, it was with the 356 Abarth Carrera GTL that the company name would be more associated with Fiat than any other in the years to come. Fiat supplied part finished cars and in return received lots of publicity, indeed in 1972 they claimed that Abarth-modified cars of the marque had taken as many as 7,200 outright and class wins to date. Only a year before Fiat had taken over the company due to its precarious finances, keeping Karl 'Carlo' Abarth on board however as technical consultant. The Abarth 595 was based on the Fiat 500, on which Abarth increased the engine capacity to 594 cc, just under the limit for the European 600cc racing sedan class. High compression 10:1 pistons were used together with a special camshaft, a specific alloy sump, Abarth valve covers and air filter, propped up engine lid and wheels were fitted and of course the exhaust system was a special in house model. This package together with lowered suspension, flared arches and 10 inch rims amounted to what was known as the Assetto Corsa SS model. This cheeky chappie is great fun & the best driving Abarth we have ever offered. These models are ever increasing in value & are a great investment. Our Fiats come recommended by a leading authority on Fiats & parts specialists – Ricambio International Ltd. I actually have a light blue 1965 500D that makes up part of my own private collection & every body loves it! It always puts a smile on my face, plus you don’t need to worry about the rising petrol prices – Just enjoy! We also have other Fiat 500’s currently in stock & arriving from Italy every month. As we are a Mercedes Pagoda and R107 specialist we are always happy to part exchange one of these type of cars or indeed any classic car of excellent quality, so please don’t miss this most fastidious example of the iconic Abarth 595. This vehicle is exceptional value, try & find another as original & tax exempt – Please remember ‘you get what you pay for’. Our cars are hand picked by a marquee expert & we turn down 8 or 9 out of every 10 cars offered. 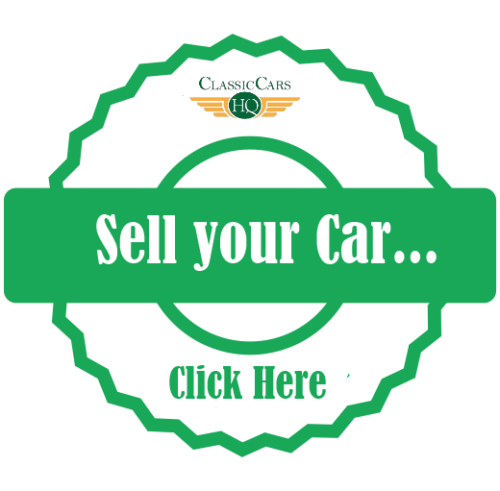 The cars we sell, are we believe the best of their type & are here to be viewed & driven in the UK. This takes the gamble out of buying a car direct from Europe sight unseen. Our stock comes fully UK MOT’d, serviced & detailed. Don’t confuse them with other cars on the internet which have had dubious restorations & are offered with a low asking price. There is always a reason why a car is being sold cheaply! Again ‘you get what you pay for’… This vehicle is we believe the best in Europe don’t settle and ensure you view this stunning example… More photos available upon request, PX always considered. Can be viewed at any reasonable time by prior appointment. We will always buy back cars we have previously sold… Delivery by road, or packed and shipped, or air freight all possible by arrangement at excellent rates, car is ready to drive away today or be delivered to your door… We are always keen to purchase Mercedes Benz Pagoda’s (W113) or late 300SL (R107) models, so please give us a call for a friendly chat if you are considering selling, we would love to hear from you. We also hold many parts in stock for the above models & have our own restoration facilities, where we restore these glorious old Mercedes to Stuttgart factory standards.